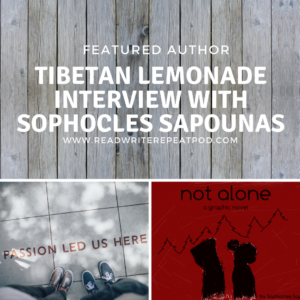 Sophocles is our April guest on Read.Write.Repeat! He is a super talented graphic novelist and all around cool human. You don’t want to miss what he has to say during the episode, which will air Sunday, April 29th at Noon! While you wait, read this wonderful interview I did with him in December! Join me as I chat with author and graphic artist Sophocles Sapounas about balancing writing, artwork, and revision with playing guitar and with kitties. 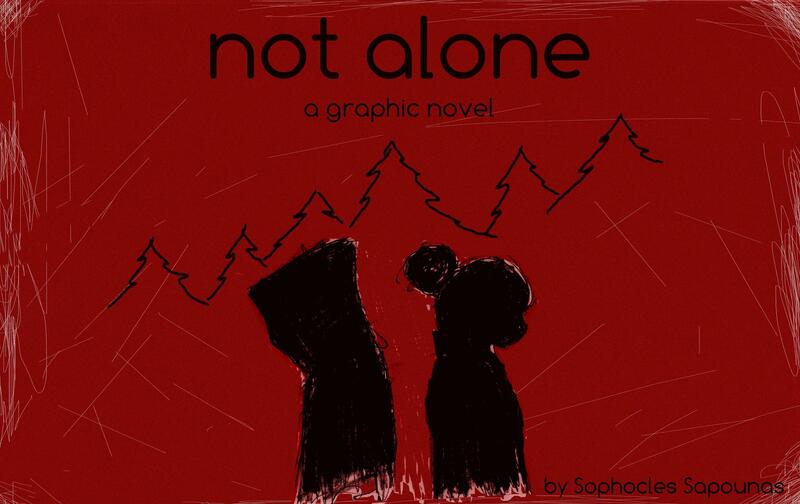 Sophocles is currently working on Not Alone, a series of graphic novels about traveling, friendship, and the tragicomedy of life. Don’t miss Sophocles’s great writing process or pointers on getting into the artistic lifestyle and finding your confidence. Q: Tell me a little bit more about Not Alone. What inspired it? What are your hopes and dreams for the series? A: Well, a lot of things inspired it really…it was during a point in my life where I was growing increasingly frustrated with myself. I spent a lot of time dreaming about being this, or that, or writing a great novel or a movie or something in that vein. I knew I wanted to do something, to make something but didn’t quite know what. I was randomly re-reading Scott Pilgrim and it was great because it had been some time since I read it, and all of a sudden something clicked; I thought to myself “I’m gonna make a graphic novel.” and it started from there. I think I fell for Bryan Lee O’Malley’s deceptively “simplistic” style and thought that it was approachable, and something I could do too. I was so, so wrong by the way, but at the time I was so infatuated with the belief that I could, so I stopped what I was doing and started right then and there. Thematically and artistically however, my inspirations are pretty much everything; everything I’ve read, watched, seen, heard, etc. etc. What’s great about storytelling is that you can use everything you’ve ever loved as sort of stepping stones to your story. 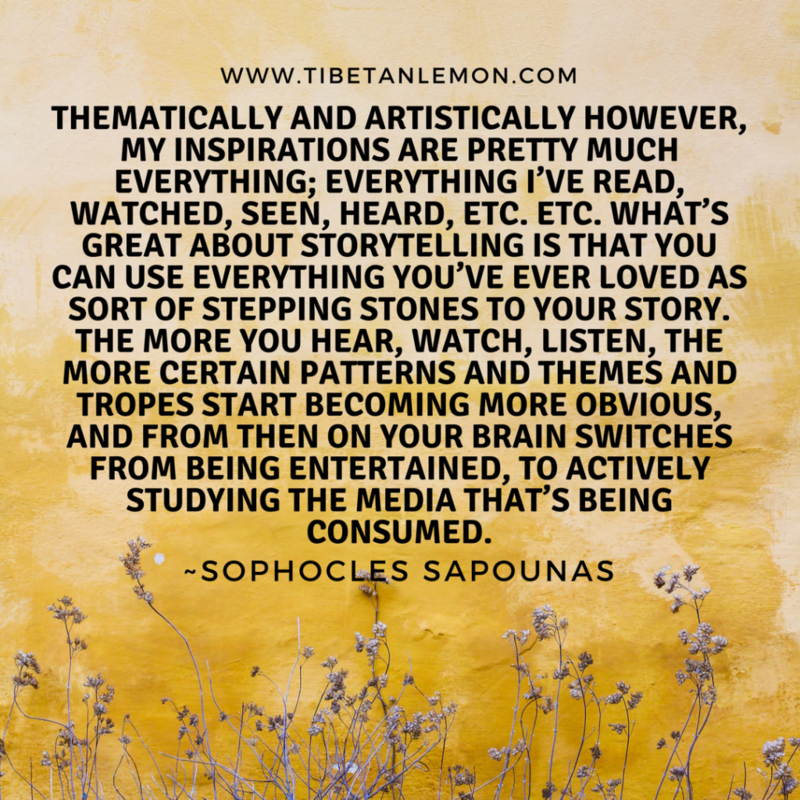 The more you hear, watch, listen, the more certain patterns and themes and tropes start becoming more obvious, and from then on your brain switches from being entertained, to actively studying the media that’s being consumed. I also love just existing in society and watching people interact, a fly on the wall. Or even watching nature do its thing. Walking is a great tool for creativity I think. It gives you a break from the task and soothes the mind, allows you to mull things over, and can even inspire you randomly. My hopes and dreams change from day to day, but in the end I want to be able to do for someone else what O’Malley did to me, which is inspire someone to follow their passions and dreams and actually make something they’ve always wanted. I also hope that it gets more people into being in the outdoors. And this is where my own life starts to come into play as far as inspiration. I love hiking and just winging it with my friends. Some of my favourite memories come from camping, or “roughing it” in the cities we’d travel to when we were younger just to skateboard in different places; sleeping on couches and floors, and being “miserable” (tired, hungry etc.) while trying to get from point A to point B. A lot of my life was spent outdoors with my friends and I think some of that magic is lost these days. Maybe it nudges the readers to go out and have an adventure for adventure’s sake. Q: What is your writing process like, and how do your kitties and guitar factor into your creativity? A: This is actually a really good question because…I’m not quite sure. At this point in time I’m actually busy writing the script for the second volume, and for a while I caught myself trying to think about my mindset and headspace when I was working on the first. But that was then, and now I’m in a totally different place both literally and figuratively, so I kind of stopped trying to think how I did it once upon a time and started fresh. Even the script format this time around is different. For volume 2 I knew that I wanted each chapter to be around 20 pages, whereas the first volume was more free-flowing which I didn’t like in the end. So I broke it down into 10 chapters, and started a rough outline with the major story beats serving as each chapter. Then I broke those down into smaller beats, and I broke those down into brief sentences. Almost like a college paper if you think about it. Usually that gives me a kind of working idea of what’s going on in the story; like a hazy dream where the details are just out of reach. My job then is to start pinning down the details and making a clearer picture. And then that picture, which is like a jumble of words and imagery starts turning into panels and pages. A major difference this time around is the lack of detail I give myself in the panels. In the first volume I’d write extensive information like camera angle, precise placement of the characters, what’s in the background etc. Essentially, too many details that slowed down the writing, and, as I found out later, would get changed or discarded. Because sometimes I’m limited by my own skills, and this scene I set up in the script I just can’t put down on paper. So instead of wasting time trying to do something that’s overly complicated, I’d revise on the spot and it’d come out better. Honestly, halfway through the book I stopped using the script for anything besides dialogue, and made it up as I went along. This time around I set up the scene, focus more on the dialogue, and know that I’m capable of eking out the details when I begin artwork. Now, the actual process? I sit at my computer, stare at what I’ve written and start to imagine it in my head, and then I try to think what would logically happen next. I type the scene out, start the description of panel one and the dialogue, maybe panel two. At that point I stop, get up, play with the cats a bit, or maybe go and strum something on the guitar, play a round of Rocket League, read a part of a book or comic, and then go back. I think they sort of let me get around that “block” that happens when you just don’t know what comes next. Petting the cats or playing the guitar forces me to stop overthinking. They’re not distractions, more like writing aides. There’s something to be said about the joy and stress relief that pets can offer you just by existing. Plus my kippers don’t ever get in the way when I’m writing or drawing (Well except for their fur in the inkwell x/ ) If anything they just sit close to me and wait for pets. When I’m done with that I sit back down, and just keep doing the same thing over and over. Sometimes I’ll get into the zone where the story and dialogue are just flowing and I’ll get up after 2, or 3, or even 5 pages are done. Sometimes I’ll barely make it past the “Scene: bla bla bla” part. I repeat the above until the first draft is done. Then I shop it around with my friends, myself, and anyone who might listen. After that it’s editing; dialogue, scenes, pages, even the entire story. Q: I would love to know more about what is involved in creating a graphic novel. What is your basic process from idea to completion? A: In the beginning it was just a LOT of thought. I’d sit on my couch for hours and just think. “Ok, you’re gonna write a graphic novel right? So, what’s the story about? …..no that’s lame, what else? Hmmm, that might work. What’re the characters? How many characters? What do they look like, who are they?” And so on and so forth. I basically planned the whole story in my head first, and made sure I had an ending. I think that’s key, knowing how it will end, because you can work back from that. If everyone lives happily ever after, you can ask yourself “ok, well before that what happened? And What happened before that?” etc. Then I started typing everything just free-form in my word processor. Terrible punctuation, run ons, tangents, essentially typed word-vomit until I ran out of juice. Then I’d look at it the next day and try to sort out plot holes, fallacies, the bad ideas in general, then started all over again until I had a summary of the entire story. This is where I figured out the majority of the nuts and bolts of the entire project / series. THEN I started writing the script. And because this was all new to me, every step involved lots and lots and LOTS of googling, and researching, and reading, and just information hoovering on script formats etc. After the script is done, primary artwork takes place. Which, again, I didn’t know how to do for volume 1 so I spent two years just learning how to draw. While I was doing that I was constantly obsessing and mulling over the story, the characters etc. and making necessary changes. During primary artwork I try to have it as airtight as possible so I can just follow the script and focus on bringing it to life. As I mentioned before that kind of went out the window but it’s still a good idea to have a solid foundation before artwork. For me at least. Once primary artwork is done it has to get scanned, cleaned up digitally, and prepped for printing. Honestly, I wasn’t prepared for that either and the amount of time I had to spend to get all the missed pencil marks…let’s just say I know my way around the clone stamp now. After that it’s a matter of finding a printer and making sure the files are good. Then presto! You’ve made a book. My typical schedule is something like this: On the weekdays I wake up, go to work from 9-5, exercise every other day, eat and goof off for a combined hour, and then either write or draw from then on until around 11-12. In between I’ll take breaks and prepare for the next day. I try to keep my weekends art-free so I can spend time with people or just blow off steam and give myself necessary space from the project, watch movies, play videogames, hang with friends etc. Sometimes though it’s hard to stick to the weekday schedule, and it’s fun for me in the end so if I do artwork/writing on the weekends for a few hours that’s ok too. Q: How do you create the artwork for the novel? 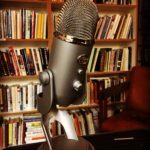 What mediums do you use and how did you learn those? I learned these through imitation and experimentation. I refused to learn how to ink until I was good enough at drawing with a pencil. I did some mild experimentation with inking over random drawings, but I essentially used the pressure of the project to force me to get good quick. If I messed up the ink, I’d waste all that time spent on pencils. Time is scarce, so I’d terrorise myself into being good. So I pretty much learned how to ink on the fly. Q: You mentioned that you started out unable to draw a stick figure. I perused your Instagram and was quite impressed with your skill. How did you go from a complete lack of confidence in your own ability to learn how to draw, to drawing such fantastic artwork? A: Well I don’t know about “fantastic” but thank you for the kind words ^___^ I think the answer is an undying belief that practice, failure, and sheer volume can take you anywhere you want when it comes to a skill. I embraced my lack of skill and talent, and pumped out hundreds of terrible freehand drawings, copies from life and from the computer, and traces of other people’s art. I really enjoy the process of learning, and getting good at something; becoming acquainted with the tools, learning their quirks and finding out their “personalities”. After a certain point I began drawing from reference and trying to make it look how I wanted. Once I got “good” at drawing from reference I began looking through hundreds of images of the locales, scenes, and scenery that I knew I’d have to depict in the books. Mountain vistas, trees, obviously people in action shots/poses, train tracks, cars, everything. Again, I relied on learning what I needed as I went along. If say I couldn’t draw a tree, I’d wait til the part in the story where there were trees in the images. I’d stop primary artwork, research and draw trees over and over until “good” enough to use in the actual pages, and move forward. That way I didn’t have to spend three years becoming an amazing artist that can draw everything well. I used necessity to dictate what I had to learn, and so if I didn’t need it I wouldn’t know how to draw it. Unless my script asks for a cat, I will probably never learn how to draw a cat. I don’t want to be an artist at the end of the day. I just want to make and finish this project if that makes sense, so I need to be efficient with my time. In doing that I tend to look for “patents”, or the easiest /simplest way to draw something; enough to convey to the reader that what they’re looking at is a tree, an ear, a rock, etc. Of course, I’m not THAT utilitarian. Obviously I curated an aesthetic, and an artistic style. I knew how important that was. It’s the same as finding your “voice” as a musician; a way to sound/look/feel like your self, and not just an imitation of your favourite artists. I knew I wanted my inspirations to shine through, but I also didn’t want to be a ripoff. So I cultivated my sense of taste and aesthetic, studied other artists, boiled them down to what aspects I liked personally and incorporated them. I took Oda’s head shape and ears and tweaked them, O’Malley’s manga-inspired style, Mignola’s use of blacks (which I inverted with white–essentially using more white space than black), sumi-e inspired environments, that certain “something” that makes me appreciate analog over digital, the appreciation of imperfections… like a mix and match which eventually turned into my own style. Q: You mentioned that one of your favourite things to do when you are obsessing over an artist is watch or read their interviews. Who are you currently obsessing over and what was it that captured your attention? A: Hmmm, I’m kind of in an in-between lull at the moment but a few months ago I was REALLY into Inio Asano (creator of Goodnight Punpun). It’s interesting to learn about comic creators, any artist really, and what makes them tick; what drives them, what informs their vision. They have their own unique presentation. And comic creators especially, by merging two mediums into one. You can argue that a movie writer is the same, but in order to make a movie you need a full crew of people to bring it to life. A solo comic creator embodies all of those roles: the director, the writer, the set designer, lighting, casting, costume design, etc. etc. I try to stay as open-minded and well informed as possible so I’m always on the lookout for new artists, and works. But I tend to cycle around a select few: Kazantzakis, Twain, Monty Python, Don Rosa (specifically The Life and Times of Scrooge McDuck), Murakami, Philip Pullman, Douglas Adams, Henri Bergson, Bryan Lee O’ Malley, Mignola, Wes Craig, Yuko Shimizu, Yorgos Lanthimos, Sophocles, Aristophanes, Tarantino, Wes Anderson…honestly it goes on and on. I could write pages just with the names of influences from all sorts of mediums, even music and philosophy! Q: What has been the biggest struggle for you so far? How did you work through or overcome that struggle? A: I think the biggest struggle is trying to balance a normal, healthy life with this all-consuming, obsessive habit of creation. Spending time with family, friends, significant others, going out, traveling, maintaining a sound mind and body through meditation, exercise, diet, hygiene, and learning how to relax is JUST as important as being passionate and single-minded about your project. A lot of times all I want to do is just work on my books. I don’t want to eat, or sleep, or do chores…literally anything else. But that’s no way to live really, and I’m sure even if I did it’d drive me crazy and I’d get sick of it. That’s why it all needs balance. Sure a project takes time, and dedication, and all too often you’ll have to say no to a lot of outings, family gatherings, fun stuff… All too often it can drive people away, and create resentments. The most heartbreaking thing is when 99% of the people around you will not find the same importance in your project as you do, and will treat it as a waste of time, or quixotic, and resent the fact that you won’t spend time with them. Relationships can, and will get strained, and it’s justifiable really…it can be very trying for everyone. Thankfully 1% of the people you know will understand, and prop you up, and offer support so whatever you do, make sure you keep them around. That balance of dedication to a craft/project/quest and purely living life for the sake of experience is precarious. In fact I’m pretty sure that’s what The Life and Times of Alexis Zorba is all about. You can’t…or shouldn’t do one or the other. It has to be in moderation. Some people are ok with being alone and immersed in their world. I like being around people and having relationships etc. etc. I thrive on it because I learn so much from life simply by participating in it. After all how can you write about life and people when you haven’t lived it? My imagination isn’t that good, so I have to go through it in order to write about it. Of course there’s the other struggles and insecurities of artistic ability, the legitimacy and quality of a project, and general competency. “Who am I to do or say this” is a constant question to pop up. What saves me from that is the project itself, the drive to finish it for no other reason than to leave something behind me and to be able to say that I finished something, that I did something. I know my soul wouldn’t be able to rest until I did it, so I’m compelled to. I’ve always thought that artistic expression is an exorcism of that compulsion, giving it a way out. To me anything can be an art if you take the time to learn about it, and get good at it; gardening can be an art, mopping can be an art, being a parent or friend can be an art just as much as drawing or sculpting or being a professional athlete. If you can channel yourself through something, and do it knowingly while present, and find the joy of losing yourself in the feeling of flow (aka the zone) then you’re an artist I think. However, even if I believe we are all artists, that need for expression through something can get repressed due to a variety of factors. This repression I think can lead to a whole factor of issues that, to me, are worse than the existential/interpersonal issues I have when I’m in the middle of creating something. Q: How did your passion for writing and drawing evolve? A: I’ve been writing in a variety of ways since I was young. Reading was always passion of mine since I learned how to read, and I knew I wanted to be a novelist one day from a relatively young age. I’d write little stories when I was eight or ten, re-read them, and toss them away. Then I got into writing lyrics for my music, which evolved into poetry and short stories which were mainly focused around the absurd/comical. I’ve never taken formal writing or drawing classes, and my teachers have been the books I read. Actually, my dad once said (speaking about his cousin who began writing) that eventually after reading so much, it’s almost inevitable that one would begin to write; I think that happened to me too. I’ve been thinking lately that growing up in the time of instant messaging, and texting, has forced me to learn how to be conversational through writing, and cultivated my ability to tell a story funny enough. But the difference is the visual aspect of the graphic novel, of which I attribute to my passion for cinema, and art in general as well. Visual gags, aesthetic “themes”, things that make the visual arts just as legitimate as writing. 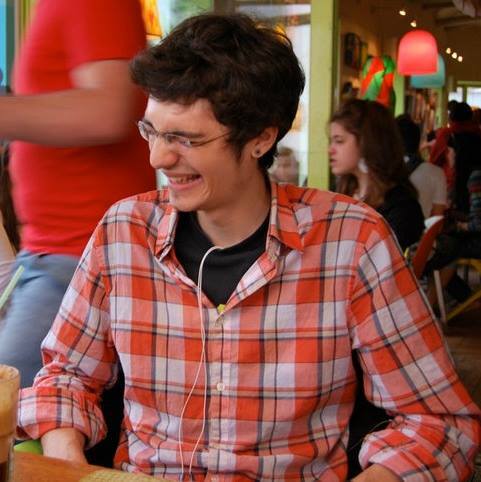 Laughter is a big big deal for me too. I love to laugh, and I love being moved to laugh. I’ve laughed so much through books and comics and movies, and I want to do that for others as well. Sure I love a good complex story, engaging characters, drama, conflict, and all the other factors we use to claim that something is “good”. But I think laughter is one of the salves of the soul, alongside love, that liberates us from the absurdity of existence and life. Aside from entertaining and offering a way to pass time, I’m passionate about being able to offer that sense of comfort I got from other artists, novelists, musicians etc. The notion that I’m not alone, and that what I’m going through or thinking about is “normal”, and that things might just be ok in the end. Books, movies, music and art in general has guided me through some tough times when others couldn’t, and I hope my work can act as a “life guide” to someone younger just how other’s work did for me. I don’t want it to just be something my peers or critics will think is “good”. With respect to this series however, and my attempt at being a graphic novelist, I’ve been writing/drawing for three years now. Q: What tips do you have for someone interested in creating their own graphic novel? A: Git gud. Hahah but really that’s what it boils down to. Learn anatomy, learn how to use your tools of choice, be focused, be driven, keep failing, keep producing. Look at the world around you; take in details about the sky, the trees, the buildings, everything. Cultivate your aesthetics and your taste; your output will only be a fraction as good as your input, so make sure that input is A++. Be voracious in your consumption of art in all its manifestations. Read, watch, listen. Figure out what your favourite artists like, then figure out what you like, why you like it, and let it guide you. Make mistakes, live and learn. It’s ok to quit if it’s not working out, and it’s ok if something isn’t perfect. Just keep the project going. That finger you drew that looks weird in that one panel? 99.5% of people reading/seeing it won’t even notice. Say no, stick to your principles, but also be open and always willing to listen to, and learn from others. Have a story first and foremost. It’s all about the story, let it guide you. Learn what makes stories tick, what makes some better than others. Practice dialogue. Say things out loud, ask yourself if it sounds normal for someone to say that. Bad dialogue is worse than bad art. Fall in love with your world and your characters, let them do the writing for you. Be patient, be diligent, be disciplined. Set a schedule, and set your own deadlines and stick to them. It’s ok if you diverge from it though. It’s ok if you goof off, or go on a vacation, or spend time with loved ones. Rome wasn’t built in a day, but it sure got built. Go to school, make friends, don’t avoid difficult situations. Keep learning. Get a “real” job and don’t worry about making money from your art right away. There’s nothing crueler than forcing and squeezing your art and passion to make you scrape by a living. Eat well, exercise, meditate, get good sleep. Be yourself, cause that’s the only thing you have to stand out. You can read about other people sleeping for 4 hours, or finishing books left and right, and in general being better than you. But that doesn’t matter. Also, don’t listen to me. Find what works for you, stick to it until it stops working, and take it from there. Doomsday prepping survivalist uncle raises niece in the years since man’s folly became the fall of man (aka apocalypse). One day he vanishes with nothing but a faint trace. Our heroine quests for his whereabouts, while silly things keep getting in the way: an amnesiac co-protagonist, a city slicking cowboy, mexican ninjas, and an end-of-the-world party that never ended, and the clan of Bob just to mention a few. Will she find her uncle? Will he remember his past? And what’s so bad about artichokes? Well ask not, but read on and find out! Kelsey Stone, also known as @scifistone on Twitter, is an aspiring author and current Master’s of Fine Arts in Fiction candidate. Her latest project, a science fiction book titled Sabiak’s Creed, is currently being reviewed by several agents.